Review Context: My LEGO game’s history is LEGO Star Wars: The Complete Saga, LEGO Harry Potter: Years 1-4, LEGO Pirates of the Caribbean, as well as LEGO Island and LEGO Racers. LEGO Jurassic World is a game that I didn’t even know I was waiting for until I put it into my system. It’s been a long time since I’ve played a Lego game, and going in, I really didn’t know what changed over the years. These modern “collect-a-thons “ still shine bright and are really fun to play. Getting to explore the island of Isla Nublar really is a wish come true, even if it was only in Lego form. Released alongside the new movie in the Jurassic Park franchise, LEGO Jurassic World includes the stories from Jurassic Park, Jurassic Park: The Lost World, and Jurassic Park 3, as well as the story from the newest adventure, Jurassic World. Starting the game, it automatically starts you with the prologue episode, which contains scenes from the beginning of Jurassic Park. The lighting and graphics all really shine, even for a ‘not so graphic heavy’ game. 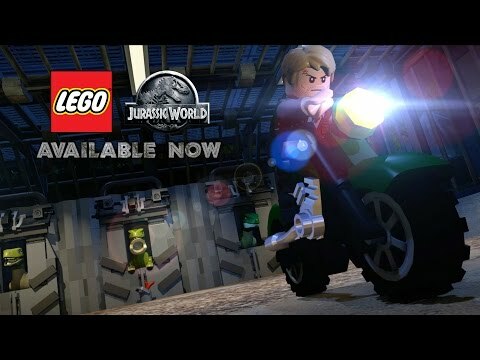 Like normal Lego fashion, the entire game is filled with humor and a lighthearted tone, being careful not to show anyone getting eaten by massive dinosaurs like in the movies. After all, this is a children’s game, and while the “deaths” do occur to follow the story of whichever adventure you’re on, it creatively avoids it while keeping the humor. After the introduction sequence, you arrive at the Jurassic Park helicopter pad. Here you can choose to continue the story of Jurassic Park, or you can go straight to the new story of Jurassic World. 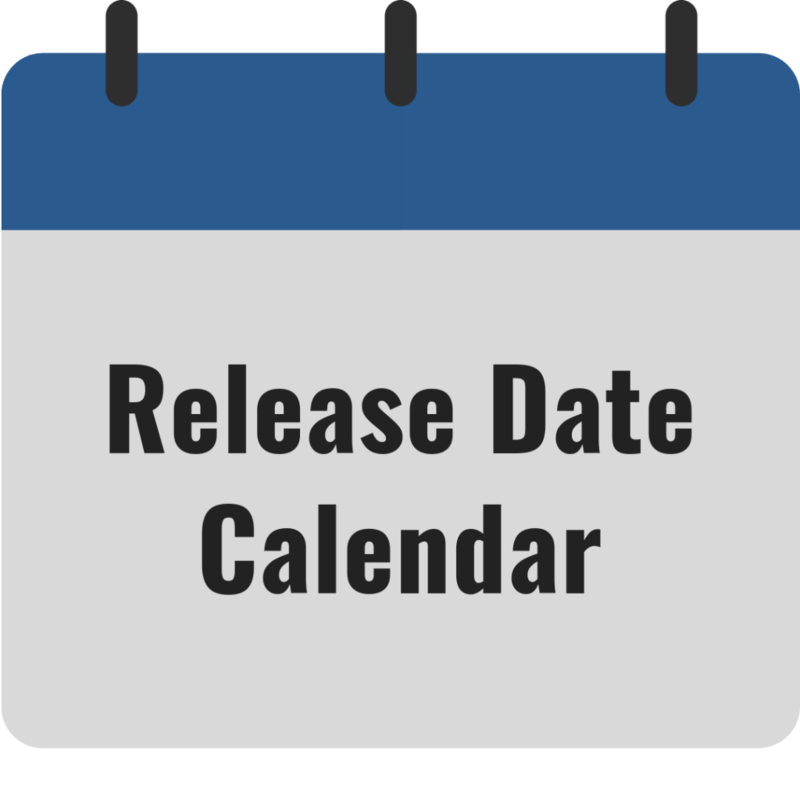 Do be warned, if you haven’t seen the new movie yet, its best to wait until you do because there will be spoilers. In order to unlock Jurassic Park: The Lost World and Jurassic Park 3, you will need to complete the Jurassic Park stories in order. 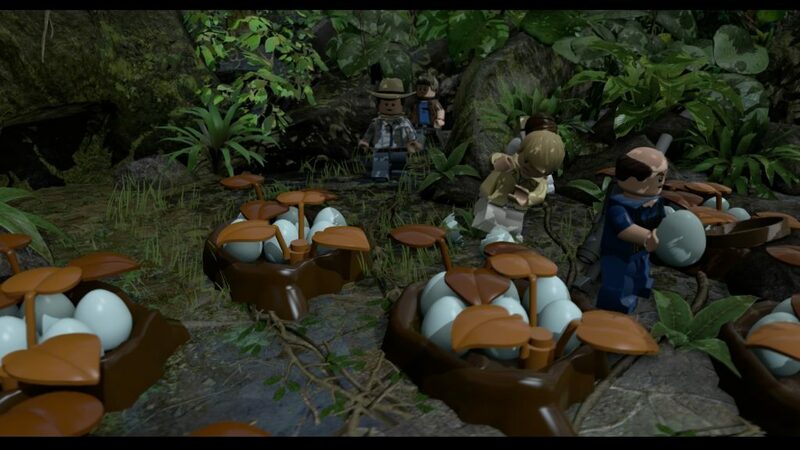 Having grown up with Jurassic Park, it was really fun to see the iconic scenes of the movies played out in Lego form. Even scenes that I enjoyed in Jurassic Park: The Lost World and Jurassic Park 3 were fun to play. The game plays in traditional Lego style that everyone has come to know; In story mode you have predetermined characters, which all have different abilities to overcome obstacles in the level. There are Lego studs you collect, which act as the currency that you can use to buy new things in the open hub world. Free modes are available for every level, so you can come back with different characters and abilities to completely collect everything. Fossilized amber makes an appearance in each level. Collecting them will unlock playable dinosaurs, which you can bring in free mode adventures, or play on certain spots on the Islands. There is a drop-in/drop-out multiplayer, so you and a buddy can play together. This is only offline coop and no online is available. I unable to test the multiplayer because I didn’t have a coop partner. As you unlock story modes in the Jurassic Park and Jurassic World portions, you open up a massive open world for each side. In the open worlds you can do challenges, find gold and red bricks, do races and there are even spots where you can summon and play as a dinosaur. 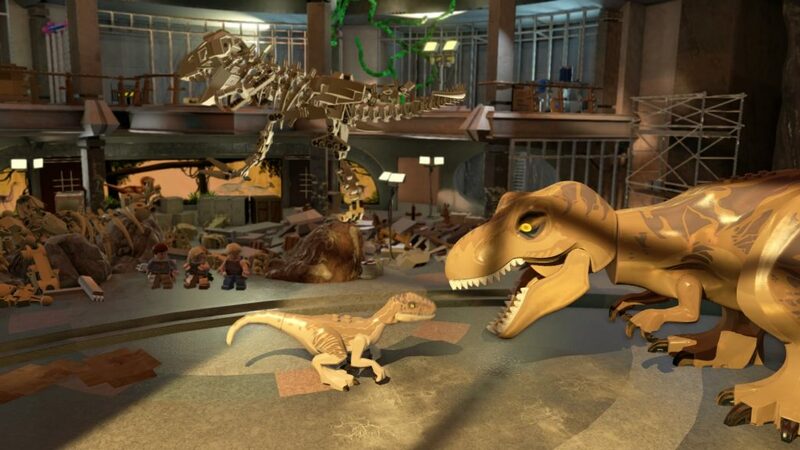 Getting to play a LEGO Jurassic Park game, and a good one at that, thrilled my inner child, but the moment the game told me to switch to the T-Rex was too exciting to describe. There are twenty fossilized amber pieces throughout the whole game. The dinosaurs are useful in many ways. For example, some can batter rocks or trees to open new pathways, and some can sniff out and dig up some items like mini-kits or tools to solve an obstacle. 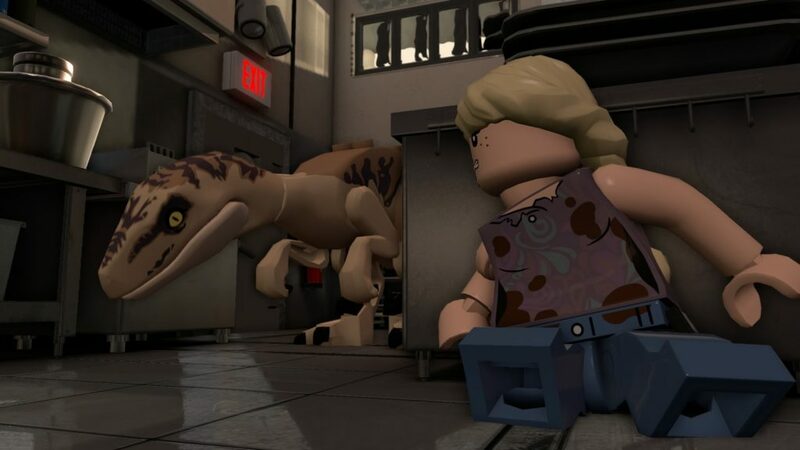 Raptors are the smartest dinosaur, and are able to actually build like a normal Lego person, pull certain switches, and can even do very limited climbing. The T-Rex is used in some pretty intense boss fights. Throughout the stories you are given opportunities to play as a dinosaur when it calls for it, which isn’t much. There is at least one boss fight in every story and the Jurassic World story has the most dinosaur usage. One of the most exciting things in LEGO Jurassic World is a feature to create your own dinosaurs. Much like the premise of the new movie, Jurassic World, you can create your own hybrid dinosaur and customize it from the way it looks with different dinosaur parts. These come from the amber pieces you find, giving another reason for you to incentivize replaying levels and collecting everything. The hybrids you create mix and match abilities, creating enhanced dinosaurs which you can then take into free mode to have fun. The last time I played a Lego game, was either when LEGO Harry Potter: Years 1-4, or LEGO Pirates of the Caribbean. These games didn’t have voice acting at all, and instead, they portrayed everything through body language and silly animations. Like newer Lego games, LEGO Jurassic World has voice acting. When I first started I didn’t like it, but after a while it grew on me. Voicing for the story is taken directly from the films, sometimes it’s quite noticeable, and if you grew up watching the films dozens of times over, you know that they moved around audio to work the story the way they needed to progress it. The famous Jurassic Park theme song is also in the game. In the open world you can hear various NPC Lego Park rangers discussing different things, which added charm and humor to the game. The controls in the game are very easy to get to know; Circle will preform actions like building or activating a lever, triangle switches characters, square is your attacks, while X jumps. Driving is easy to learn as well, as it relies on the triggers to do the forward and reverse driving. Controlling the dinosaurs is more or less the same, however, some dinosaurs like the T-Rex do feel a bit more clunky compared to the humans when trying to do tight movements like turns or in combat, while others like the raptors are smooth like the human counterparts. During my playthrough, I did experience some camera problems when jumping in and out of vehicles, but it fixed itself instantly. Besides that, I didn’t have a problem with any crashes or game breaking bugs. If you are a fan of Jurassic Park, Legos, a child at heart, or simply looking for a long lasting game, then LEGO Jurassic World is something you should pick up. It may not be dark and mature, but even games meant for children can be really fun for adults. There is so much to do in the game that just beating the game will land you around 40% complete.